This sculpture commemorates General Robert E. Lee's final surrender of Confederate forces to General U.S. Grant at Appomattox, Virginia in 1865. 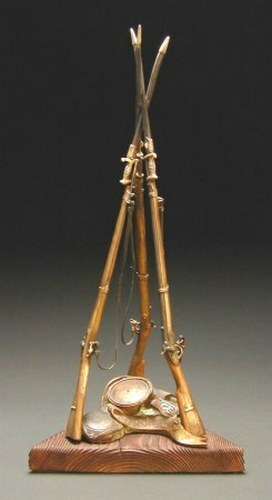 The model 1841, .54 caliber rifle and Colt's patent revolver were popular with soldiers on both sides during the "War of the Rebellion". The sharp bayonets are at long-last sheathed and the waters of the two canteens-‘Rebel' and ‘Union (U.S.)'-each nourishing the other, again flow together to form a mighty river of National unity. This also represents the "final surrender" of the individual self-will to the Divine Will; the sheathing of the sharp bayonets of body, mind, and emotions to no longer wage our own spiritual ‘War of Rebellion'. The waters of the two canteen-vessels of "Rebel (US)" and a now-greater ‘UNION' each nourishing the other, again flow together to form a mighty river of Spiritual Unity. ‘Appomattox' (18" high) is an edition of 26 with each of the first 13 dedicated to one of the thirteen Confederate states. With only one state available of each. The remaining 13 in the edition are "unmarked" for states and available for those collectors who do not wish to have one of the above and/or should all of the above be sold and these are the only ones remaining in the edition. "What is important is that entities surrender themselves, here a little, there a little, here a little more, increment by increment, to the Highest and Best, to the Divine Creator without glorifying themselves for doing so allows the entity to become more highly evolved spiritually." "CAC"